Everyday Highs and Lows: Happy Martyr's Day everyone! My husband took the boys camping for the weekend to one of last remaining remote areas with no cell phone service. I have three days with no one to take care of! Wow! That felt good. Truthfully, I am giddy! No cell phone texts with blood sugar numbers. No snacks. No meals. No whining. No talking about farting. No little boy toys. No fighting over "just one more level". Best of all, no Minecraft!!!! I don't even have my new puppy yet! Just me for three whole days and only my wants and needs! Yippee! Gee... Gosh, I wonder what those will actually be... Seriously. I have no idea. Ok what to do first? Drink? Unabashedly, eat carbs? Call and catch up with my BFFs? Clean the house of any trace of my family? I know... NAP!!!! Nap without the cell phone glued to my head. So since I dropped them off I made a list of how my first night went! Drove home from dropping the boys with my husband. Turned on inappropriate Eminem and sang really loud! Saved a turtle (see the post below). Got home turned off the phone and took a NAP! Was so excited to take nap I forgot about a conference call I was supposed to be on and missed half of it once I woke up. Sorry to my friends who had to wait. I'm sure you understand. You have D kids too! Turned in an article for my job. Wore Jammies from 5 til noon the next day. Sat on the deck and stared into space. Had original thoughts. Some deep. Some not. Checked phone for a blood sugar reading. Posted something on FB so when I checked the phone there might be something to actually check. I knew I fooling myself into thinking I was checking phone for Facebook love when reality is that I have a terrible habit of checking it when Rocco isn't with me. Wished I knew how to smoke because smoking in my house without anyone was around would probably be fun. Listened to Pink on my iPod and sang really loudly!! Danced uninhibited. Around the whole house. Straightened house for an hour. Putting/erasing any signs of my needy family. Put away shoes, kid cups, back packs, socks, husband's randoms, lunch boxes, toothbrushes, wiped toothpaste out of sinks. Looked around when I was done and it looked too pretty. Too neat. It was eery. So I left my glass in the sink and didn't wipe down the kitchen table. There. Better. Thought about how lonely I will be when they go to college. Cried a little about the idea if it. Cried a little more when I looked at their baby pictures. Then spied a pair of little boy superhero underware left behind the bathroom door AGAIN and got over all that sadness real quickly. Counted how many years til college. Did a load of laundry. Realized I hadn't checked phone in an hour. Progress. Looked in a magazine. Made a mental to-do list of all things I probably will never do like make a planter, make the perfect pot roast and lose my belly fat. Ate some carbs and didn't check the box for the carb count. Why are uncrustables the world's perfect food? Locked up the house and covered the bird cage. Silently thanked my husband for always doing these tasks each night to protect us all. Snuggled in to watch Scandal my favorite show. Ate a mini snickers. Checked the carbs out of habit. Cursed myself for my lack of progress and ate one more. Watched three more shows. Stayed up until 1 am because tomorrow I DON'T HAVE TO WAKE UP FOR ANYONE. Included a prayer to let me please not wake up wide awake at 7. Please God! Didn't check my son's midnight blood sugar number and didn't set my alarm for his 3 am blood sugar number. Silently thanked my husband for doing these tasks for me for the next three nights! In the woods. The next couple of days were pretty much the same thing. On purpose, I didn't do any dishes all weekend. I realized, pretty much, I only use glasses, bowls and paper plates. Ha! Checking my phone became less frequent as I kept myself busy with seeing friends, and shopping with my mom and sister. I slept in every morning until 9 am. I couldn't force myself past that. On Saturday night, I missed them terribly. Checking my phone now became a habit again, but this time not for blood sugar numbers, but for any sign of them. Sometimes they can text from the river. By Saturday night, my house felt eery again, like I was missing something. Sunday morning, I woke up and decided to do their laundry. I was going to avoid any kid-related chores all weekend but couldn't help myself. It felt like home again to have all their crap laid out on the couches. I was happy to miss them. I think every mother on Mother's Day who has young children should get this present. Not flowers or candy but a chance to see how boring life would be without our kids and get a chance to miss them. Yes, I know ten minutes after they get home today, I will be rolling my eyes at their silly/"stupid" antics. But this time, I think the eye roll with come with a little happy, smirk on my face. Realizing the silliness of being seven won't be here for long and I should appreciate the pre-bedtime giggly show they put on every night as, actually not one more thing in my way but, part of the fun! Thanks Michael for the gift of appreciating you all again and shouldering the kid-raising responsibility for a weekend! I missed you! 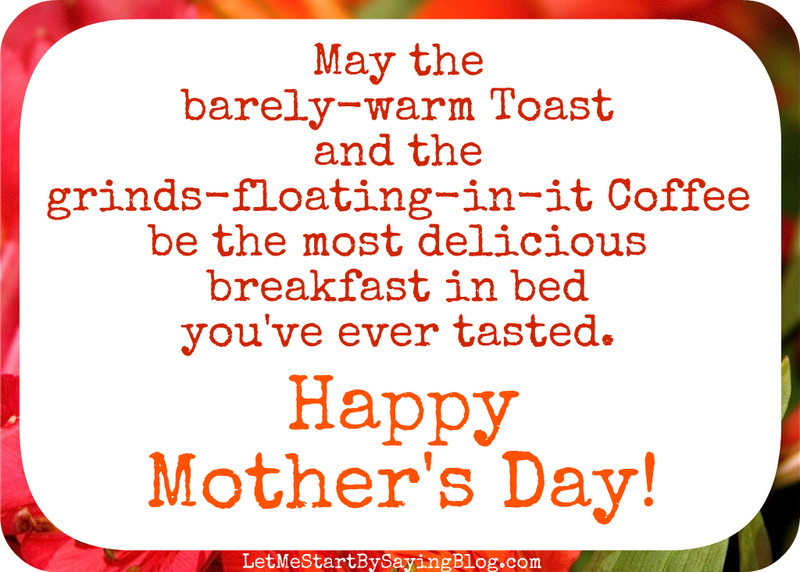 Happy Mother's Day to all the wonderful mothers out there! I hope you get a chance to miss your kids soon too! You deserve the break! To my own mother, thank you for raising me with all the unconditional love you had! I am nothing without you. You are my rock and I love you. Most of all, I appreciate you. Here are some funny cartoons for your reading pleasure.